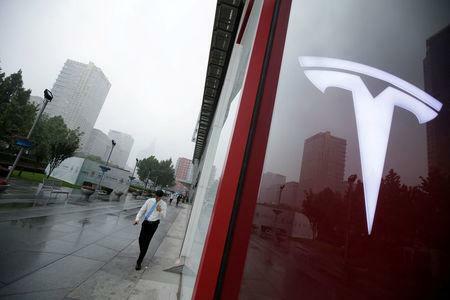 (Reuters) - Tesla Inc on Thursday introduced a new $45,000 version of its Model 3 sedan on its website, launching the car as U.S. tax breaks for Tesla cars are about to decrease. According to the website, the rear-wheel-drive model has a "mid range" battery, a range of 260 miles, 50 miles less than the long-range battery that the more expensive Model 3 is equipped with. The new version has a delivery period of six to 10 weeks, according to the website, which would customers eligible for the current $7,500 U.S. tax credit if they take delivery by the end of the year. The tax credit for Tesla cars will drop by half on Jan. 1. Although Tesla has promised a base-level version of the Model 3 priced at $35,000, so far it has only produced higher-cost versions starting at about $49,000. Tesla has said that it would not manufacture the base-level version of the Model 3 this year. Adding the mid-priced version of the Model 3 appears to be a strategic way to lure possible buyers who had been waiting for the lower-priced version. It is not clear how many of the more than 400,000 reservations for the Model 3 are for the base models.